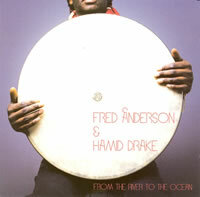 The common denominators of these recordings are Hamid Drake, one of the more celebrated musicians of the day, and the under-heralded Harrison Bankhead, who is equally persuasive as a cellist and a bassist. The linchpin of numerous AACM-affiliated ensembles, Bankhead is one of a very few musicians whose arco in the extreme high register of the bass has a warmth and fluidity more commonly associated with the cello; he also can summon a deeper, darker tone from the low end of the cello than most players, whose efforts to get a bass-like bottom simply stresses the higher-pitched instrument. The most impressive aspect of his work on these albums is that he doesn’t display everything he’s got on any single one. He’s too much of an unselfish ensemble-minded musician. Bankhead’s bona fides as a multi-instrumentalist and a mountain-moving bassist in the Chicago tradition of Wilbur Ware have been established in part on his recordings with Fred Anderson. On prior Anderson albums, Bankhead has played guitar and piano in addition to cello and bass, and has shown a keen ability to flesh out the tenor saxophonist’s skeletal lines; on trio dates like Timeless (Delmark), Bankhead’s stamina and resourcefulness in running with drummer Hamid Drake has been impressive. Bankhead goes a step further on the Anderson and Drake co-led From The River To The Ocean, penning the elegiac “For Brother Thompson,” a moving example of Anderson’s extension of the Coltrane lexicon, ably buttressed by Bankhead’s focused, sturdy piano comping. On Anderson’s old school groove-laden “Strut Time,” Bankhead’s cello slinks and saws between Jeff Parker’s guitar and Josh Abrams’ bass, creating pungent counter lines for Anderson before embarking on his own well-constructed solo. Though Bankhead plays bass on two tracks, there’s only one two-bass hit with Abrams, “Planet E,” the trenchant, motive-driven opener. Abrams plays the twangy guimbri on the title composition, a ruminative call that segues into a simmering extended improvisation, during which Bankhead’s arco crescendos swirl about Anderson’s lines, which exemplify his steadfast economy and intensity. Nicole Mitchell is fast becoming a leading exponent of what could be called AACM populism. As is the case with her Black Earth Ensemble, the flutist’s work with Indigo Trio more often evokes the ethnocentricity of Yusel Lateef and the blues and playfulness of Rahsaan Roland Kirk than the formalist frontiers of Eric Dolphy. Buoyed by Bankhead’s ebullient lines and strummed chords and Drake’s deep grooves, Mitchell plays with an old school soul that is now too infrequently heard. There’s an initially strange time-capsule quality to her message songs like her “Stand Strong,” which one can easily imagine Andy Bey singing with Gary Bartz’s Ntu Troop. However, this does not preclude Mitchell from playing serpentine lines with an amazing velocity and precision on collectively crafted pieces like “Velvet Lounge Bounce.” It’s particularly intriguing to hear this album in tandem with Mitchell’s more envelope-pushing work with Frequency, whose eponymous Thrill Jockey album was arguably the best debut CD of 2006. Something similar will most likely be repeatedly said at the end of ’07 about Live In Montreal. 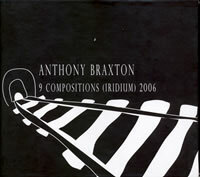 Comprised of nine CDs, a DVD and a 56-page booklet, 9 Compositions (Iridium) 2006 is monumental even by Braxtonian standards. The collection documents the bulk of Anthony Braxton’s final Ghost Trance Musics compositions, which all but brings to an end a practically all-consuming 11-year odyssey entailing a staggering expansion of his music system and, by virtue of his bringing his students and former students into his GTM ensembles, an unprecedented synthesis of his roles as composer, multi-instrumentalist and educator. Subsequently, the aura of historical moment emanating from these recordings is substantially brighter than those surrounding the multi-disc sets released virtually quarterly. Even those who cringe at the type of gushy hagiography found in several of the booklet testimonials, or nod at Braxton’s proclamation that this is “THE point of definition in my work so far” with a sense of déjà-vu-all-over-again, will be quick to feel the intense sensation of music evolving right in front of their ears. Though it is packaged almost as an addendum to the CDs, the DVD is a recommended starting point, even for long-time friendly experiencers of Braxton’s music. Despite a rough hewn method of cutting between rather static Iridium performance footage and a deposition-like shot of Braxton giving an informal talk at Columbia University, Jason Guthartz’s documentary, “What Kind of “Tet?,” provides a solid primer on the GTM, showing how Braxton’s use of sectional leaders and constantly reconfiguring breakout groups implement the mix of a composition’s primary pulse materials and the performance-specific array of secondary materials, which can include any of Braxton’s prior pieces, and genetic materials, DNA-like samples extracted from Braxton’s works. Seeing the various real-time decisions that Braxton and each of his cohorts can make throughout the hour-long performance of a GTM composition connects Braxton’s descriptions to the music far more simply and securely than an audio-only format accompanied by a text, even one as lucid as Braxton gigographer Jonathan Piper’s “Like a Giant Choo Choo Train System,” included in the booklet. The DVD also includes the complete performance of “Composition 358.” Clearly, Iridium is inimical to a multi-camera shoot of a large ensemble. The club stage flattened the ensemble’s semi-circular stage configuration, further limiting a shot selection already hampered by room-dictated camera positions. While the video still manages to reveal an enormous amount of information about communications between sectional leaders and within the breakout groups, it’s vexing not to see the full exchanges between trumpeter Taylor Ho Bynum and violist Jessica Pavone, saxophonist/clarinetist Andrew Dewar Raffo and others, and it’s frustrating to barely see guitarist Mary Halvorson at all. Despite its shortcomings, the video’s most important contribution to understanding Braxton’s current music is showing the musicians’ excitement as they mold the piece in real time, including the avuncular Braxton, who often gleefully bobs and sways with the pulse of the music. In his Columbia talk, Braxton mentions having fun as one of his current objectives and it is clear he and his ensemble are meeting it, which is notable given the solemnity of early GTM performances. This sense of play registers more vividly on the Iridium performances than on any previous GTM recording. Early GTM performances had comparatively lock-step schema, with a deliberate development of improvised or secondary materials occurring only after long, ensemble “unisons” (the term is placed in quotation marks since Braxton uses his diamond clef, which can be interpreted as any clef by each musician; each note in the score can therefore represent multiple pitches). By contrast, there is a palpable sense that anything can happen at any moment during great stretches of these hour-long performances, with the opening expositions lasting only a very few minutes before one or more sub-groups peel off in different directions. 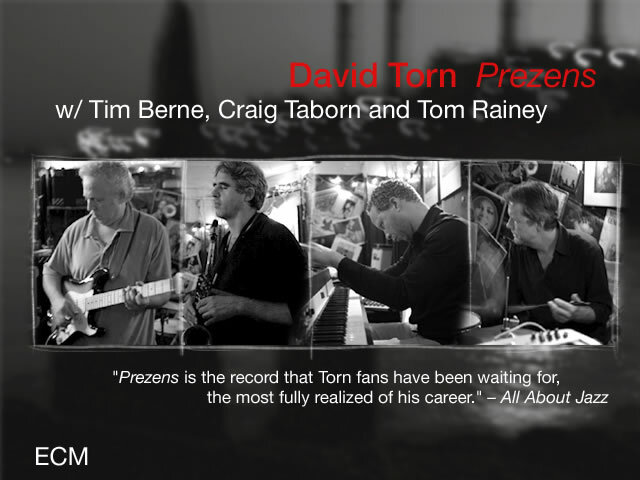 Most importantly, the expanded palette of this ensemble (which is rounded out by tuba player Jay Rozen, bassist/bass clarinetist Carl Testa and percussionist Aaron Siegel) serves Braxton’s goals far better than earlier sax-heavy GTM ensembles. The insertions of materials from Braxton’s earlier pieces stand out in bolder relief, the sub-groups’ accelerating tempi are more bristling, and the improvisations are more roiling because of the wider contrasts in timbre and tonal weight. This is truly orchestra music. Improvised music is sink or swim. Chicago Underground stalwarts Rob Mazurek and Chad Taylor validated this proposition on their first gig with Jason Ajemian, throwing the bassist into the deep end of the proverbial instant composition pool to begin an album-length improvisation on his own. It is one thing to initiate a new musician on a generic gig at a bar or loft space witnessed by maybe a few dozen locals already familiar with Ajemian’s with various Chicago units; but the stakes are considerably higher when the venue has the official luster of the German Cultural Center, and director Raymond Salvatore Harmon, his crew and a truck-load of hardware are on site to create live projections and produce a DVD. Subsequently, just treading water wasn’t going to do; Ajemian really had to bring it on. He does, establishing a very high level of energy and creativity in a five-minute solo where an almost pugilistic attack and premium on texture is not at the expense of well-developed lines and sequences. Taylor then enters with an inspired fury on traps, setting up Mazurek’s signal-processed cornet wails and growls. The ensuing barrage begged the question of where they could then go, given they had eliminated any head room for increased intensity. Wisely, they took a series of quantum leaps, traversing a series of soundscapes that are alternately shaped by electronics and acoustic instruments (Taylor’s vibes and marimba are crucial to sustaining the momentum of the performance at key points). Though Ajemian brings electronic elements to the mix, it is Mazurek’s array of computer samples and Moog-era gear that provides the more saturating colors. As Mazurek relates in Peter Margasak’s notes, post-production work with engineer Todd Carter further punched up the sound, which is best experienced via the DVD’s 5.1 surround soundtrack. 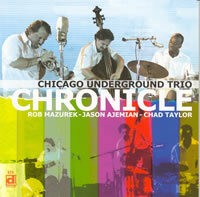 Though the preponderance of the music is non-idiomatic, Marzurek’’s soaring Cherry-flavored cornet and the impassioned interplay it elicits from Taylor and Ajemian at the end of the performance suggest that jazz remains a vital part of Chicago Underground’s aesthetic, and not just a reference point. Chronicle is also the most ambitious DVD issued by Delmark to date. Harmon meets the challenge of big unknowns like the duration and tone of every passage with a cohering use of colorization, downstream keying, and mosaic effects. There’s an overall fresh look to his work even though most of his tactics are readily identifiable. Part of this is attributable to his recurring use of cool, light colors. Harmon is also a bit stingy with the use of fast-moving, densely layered information, so when he does fully open the spigot, the resulting rush of images is invigorating, and not just another deluge. There are many moments where Harmon’s vision is just too big for a television monitor. 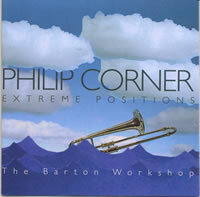 Philip Corner is a composer who recognizes indeterminacy as the predicate for improvisation. He is also a trombonist schooled in Korean calligraphy. This may explain the fluidity of his pieces for two trombones and multi-tracked trombone that comprise the first disc of the 2-CD Extreme Positions, as well as his understanding of how the instrument’s large sound can be finely calibrated. Without knowing the performers, it was obvious within seconds of “For 2 Trombones, No.2,” that they are free improvisers – turns out to be James Fulkerson, whose renown as a composer and New Music’s first-call trombonist has somewhat obscured his finesse as an improviser, and Hilary Jeffery, who has worked with Hugh Davies and Paul Dunmall, among other pioneering improvisers. Written in 1960, when Corner was in the thick of a New York avant gar\de that generally took pains to create a far more attenuated, self-effacing music, it is a flinty procedure-based piece that invites call and response-like rapport and occasionally broad gestures. The other four works composed in the ‘60s and ‘70s including “Big Trombone” (’63), cited by Davies as the first piece for trombone and tape, also use text and graphics to navigate the performers; but, each have ample portions that would prompt a blindfolded listener to think along the lines of first-wave European free improvisers like Paul Rutherford. While the two 2005 solo pieces – an examination of a single note and an explication of timbre based on experiments with alphorn – are more overtly conceptualist than their predecessors, they complement the earlier pieces well. Despite its American name, the Fulkerson-led Barton Workshop, who performs the ensemble pieces on the second disc, is based in Amsterdam; naturally, the ensemble has a sizeable contingent of Dutch musicians, which may explain the tart flavor of these performances. Listeners familiar with the ensembles of composer/improvisers like Maarten Altena will appreciate the finesse with which the strings and winds-dominated Barton Workshop translate Corner’s scores, which often don’t specify basics like instrumentation or duration, into music with an improvisational feel. “Lovely Music” (’61-2) allows each performer to choose what materials they play or don’t play. A gong is the cohering element in the piece; but without reading the description, the piece registers as something akin to a collage by an AACM composer like Roscoe Mitchell. By the end of this engrossing collection, one has a renewed appreciation of a composer’s ability to empower performers.